Has it really been 10 years since Bruce Pelz left us? I miss him still. Late in the evening on May 9, 2002 my three-month old daughter Sierra was snoozing in her crib until time for her 11 p.m. feeding. That was my window for working on the Westercon program. Logging into e-mail, I read Bruce Pelz’ answers to questions I’d sent the day before. Continuing on to other messages in my inbox, I was stunned to learn that Bruce had died a few hours earlier. He’d suffered a pulmonary embolism and died in a local hospital not long before the Los Angeles Science Fantasy Society’s weekly meeting. And when the news was announced at the club he’d led for so long the meeting broke up in stunned silence. Summing up Bruce’s life is an exercise in timebinding: Which Bruce did you meet first? 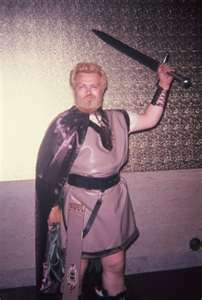 The young, hyperfannish Bruce on the way to the 1963 Worldcon masquerade in costume as Fafhrd, hair dyed blond, wearing a matching blond beard, and carrying a huge broadsword, who paused long enough to sell Lenny Bailes a Filk Song Manual, a subscription to Starspinkle, and take his application to join SAPS? The formidable 34-year-old Bruce plumping the LASFS building fund at a 1970 banquet by auctioning donated desserts, who dressed in black from head to toe and affected to be a kind of belligerent prince of darkness? Or the greybearded, book-huckstering Bruce of the late 1990s, so many fans’ grandfatherly mentor? Whichever Bruce you met first, all these avatars had in common a characteristic need to go all-out for every well-loved interest or activity. Bruce had to know it all, do it all, own it all. Before discovering fandom, writes Milt Stevens, “Bruce was an Eagle Scout. Really. I guess once he started collecting merit badges he had to have all of them.” Having transferred that passion to fandom, Bruce became the rare fan who excelled in everything: fanzines, conrunning, costuming, filksinging, smoffing, collecting, fanhistory. Bruce often comes to mind when I’m in any discussion of fanhistory or conrunning. Many of us are devoted to fan history. I regret how our stories tend to lose their precise details as time wears away the edges and gradually changes them into what people wish the history had been. Unlike the rest of us, Bruce always remembered things right. Also, Bruce was a terrific organizer, though like so many things mistaken for genius this really was talent amplified by a tremendous amount of work. That’s the way out of many problems. And Bruce relentlessly looked ahead, in his last years setting the vision of another NASFiC, another Westercon, another Worldcon bid. That’s the true source of youth, a focus on the future, and the reason why it was easy to overlook his physical age up to the very end. Although he didn’t deny it, understanding death would also be part of the future, which is why his vast collection of fanzines is at UC Riverside – a living reminder of the friend I miss. 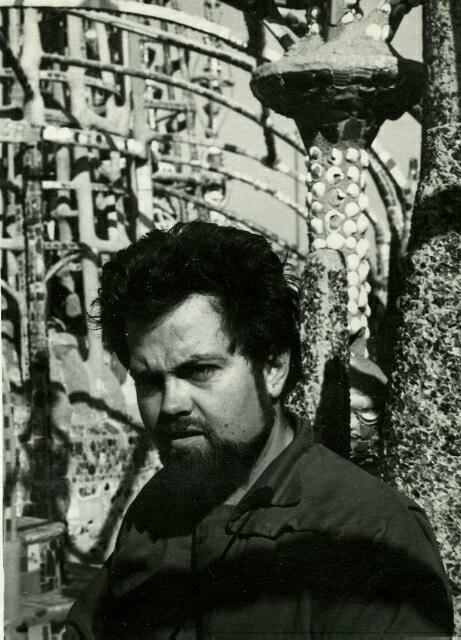 The Man In Black at the Watts Towers. Bruce, the grandfatherly huckster, at the 2000 Worldcon. Photo by Richard Gilliam. This entry was posted in In Passing and tagged Bruce Pelz, LASFS, Westercon by Mike Glyer. Bookmark the permalink. Thanks for the memories, Mike. We miss Bruce in New York too, where he was a regular attendee at Lunacon. I haven’t forgotten him, either. Excellent remembrance of a Man Of Impact definitely worthy of it. Well said, for we all recall him well. I met him at my first LASFS meeting June 1963, introduced by Bob Lichtman. He always impressed and amused! Thanks. I remember Bruce, too. I am certainly one of those people who remembers fan history wrong (which is why I like to see get it written down). Guy Lillian is putting together the DSC 50 program book for us and it is ending up to be a nice overview of Southern fan history. I wish Bruce could be at the con; I hope his spirit will be with us. Every once in awhile, I’ll see some big burly black haired guy from behind dressed in black, with a barely seen beard, and for just a fraction of a second I want to call out a greeting to Bruce. Thanks so very much for this, Mike. It seems like his name has come up multiple times in the past couple of weeks — at Corflu, in emails related to LoneStarCon, just talking. His spirit still looms. Toni, he will be with you I’m certain! He was a Force in librarianship too, and he’s in my memory there too.